No really, in all seriousness I have always really loved and admired the Joanna-Gaines-Fixer-Upper-Farmhouse style, but never actually tried to attempt it. I have some perfectionist tendencies, which – when combined with my indecisive nature – results in lots of dreaming and pinning and wishful thinking and not a lot of actual implementation. We have been in this house for almost 3 years now and the only decor that’s really been accomplished is the kid’s rooms plus some paint and a gallery wall in the living room. I have a list of what I want to do – the basement, dining room, the master bedroom, the master closet, the piano room, the upstairs hallway…but I haven’t been able to get myself to just start DOING instead of dreaming. The problem that I’m running into is that I want each and every space to be “blog worthy,” which is simply not going to happen. I mean, I’ll definitely share my updates here with you, but I don’t have the talent and the vision and the taste (or budget!) 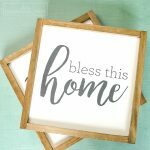 of a lot of home decor bloggers out there. I keep dreaming of our home someday looking like those beautiful home tours on Pinterest that look like a page out of a magazine, but the reality is I’m just never going to get there. AND THAT’S OKAY! Our house needs to be comfortable and functional for my family, and that’s enough. Comparison is the thief of joy, right? I’m having a hard time coming to grips with that and just jumping into some projects and decision making, choosing what I want and not what I think would be pretty and impressive in a blog post or when guests come to visit. Can anyone out there relate?? 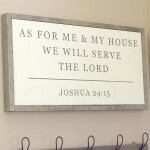 All that to say, I’m trying hard to put all that comparison and perfectionist stuff behind me and FINALLY jump into decorating our home in earnest. It’s high time we started to make our mark on this place! 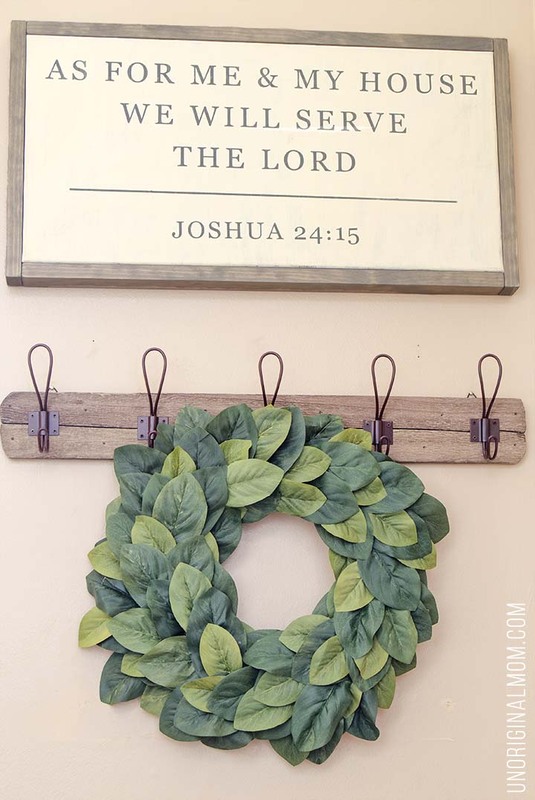 I’m inspired by all the amazing farmhouse stuff on Pinterest and I think I will go that route with much of our decor, but still with my own taste and spin to it. 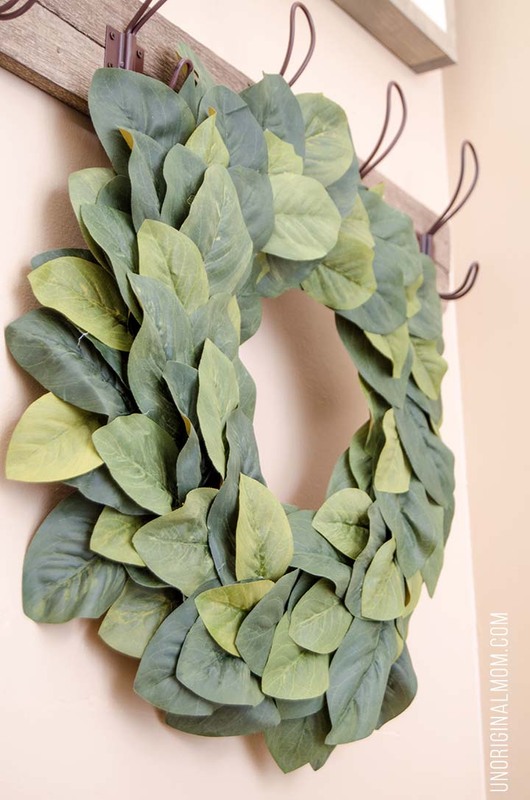 Beginning with this wreath! 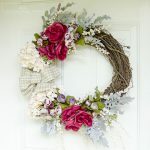 I absolutely love the Magnolia wreaths I see popping up everywhere on Pinterest, but gosh are they expensive! 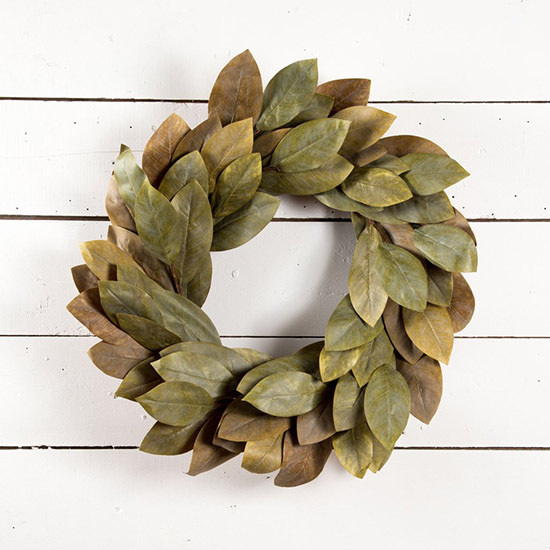 The Magnolia Market wreath is beautiful…but I certainly can’t afford the $95 price tag! 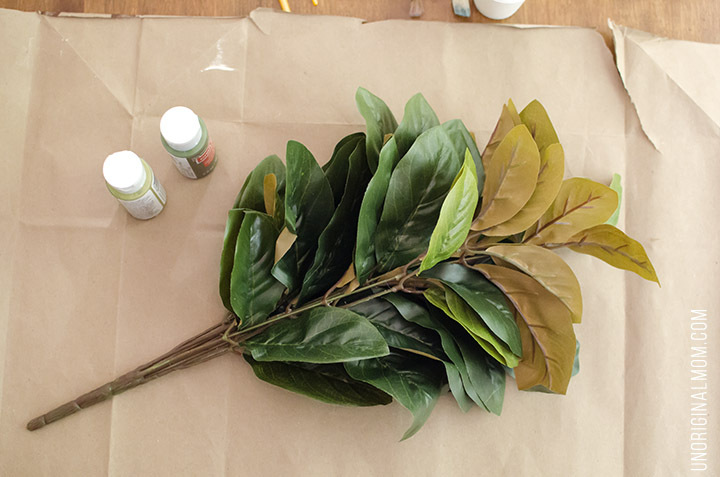 And, living in central PA, Magnolia trees are not very plentiful around here so making a wreath with real Magnolia leaves was out of the question. So, what’s a girl to do? DIY it, of course! I discovered faux Magnolia leaves at Michael’s and picked up two bunches (on 2 separate trips with 2 different 50% off coupons, of course!) for $6 each. The problem was, they just looked…fake. You know, bright green, shiny and plastic-y. 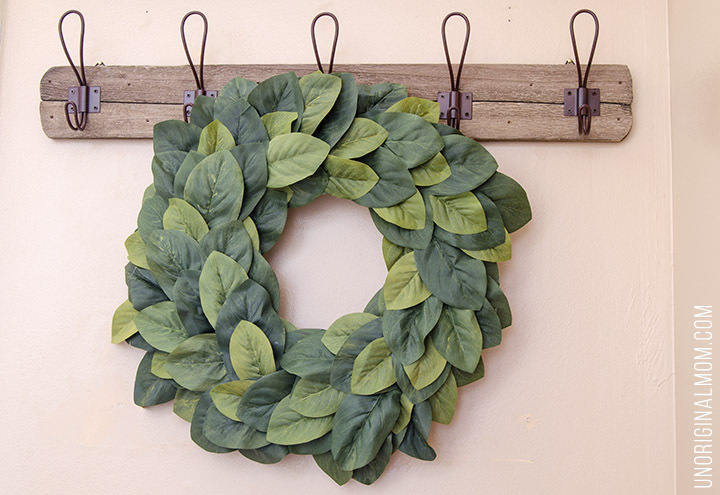 I realize that real Magnolia leaves are very shiny and waxy when they’re fresh, but I was going for the look of that Magnolia Market wreath that is super trendy in farmhouse decor right now – and as you can see above the preserved leaves are shades of brown and olive green, plus they have more of a matte finish. 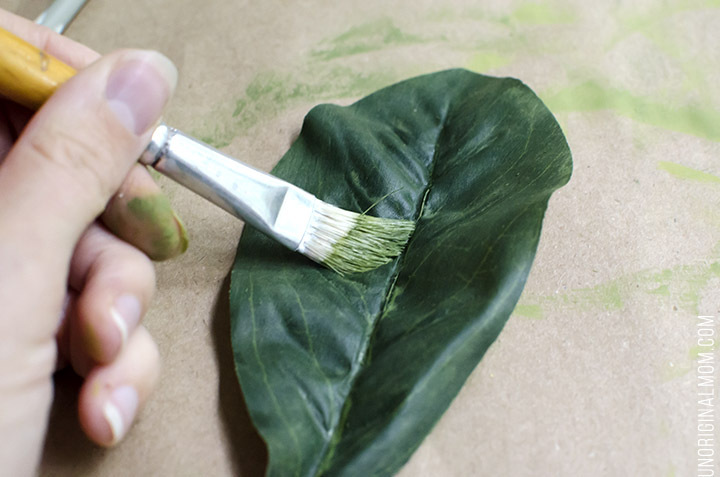 So to get more of a realistic matte finish to the leaves, and also bring them closer to the olive green color I wanted, I painted the leaves! 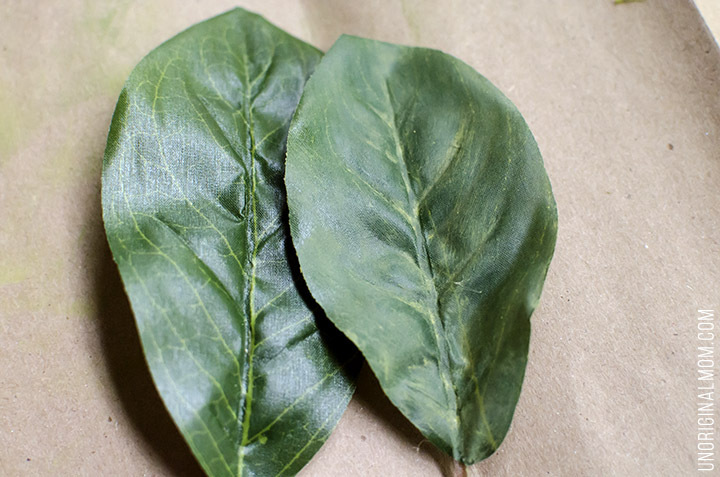 I used two different shades of green to mix together and vary my colors a bit, then put a super light coat on each leaf. I even used a paper towel to rub off the excess paint. Then I just layered the leaves on top and kept tucking them in and under each other and gluing until it looked full enough. The result was a beautiful DIY Magnolia Wreath for $15!! 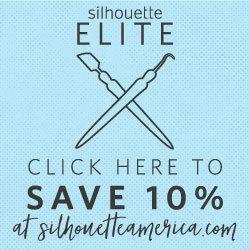 So much better than that $95 price tag, don’t you think? 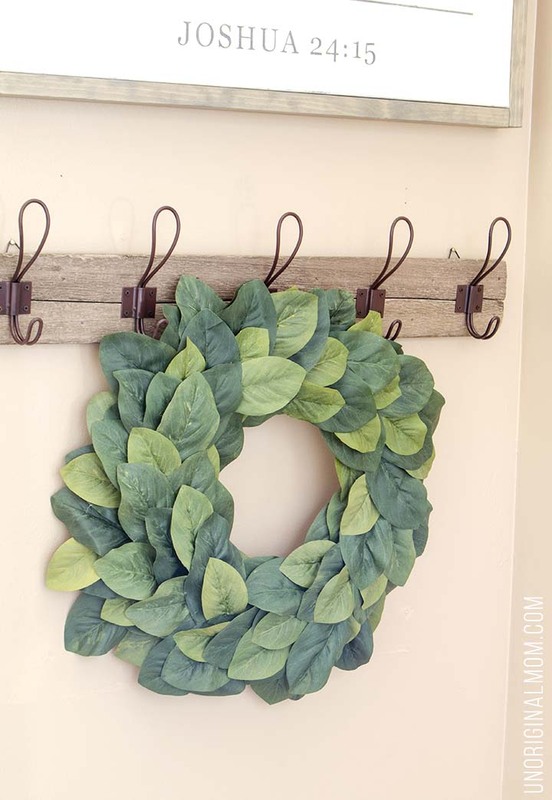 I have a feeling this DIY Farmhouse Magnolia Wreath will make appearances all over my house, I just love it so much! And I love the price tag even more ;-) I foresee many more farmhouse knock-off projects in my future! 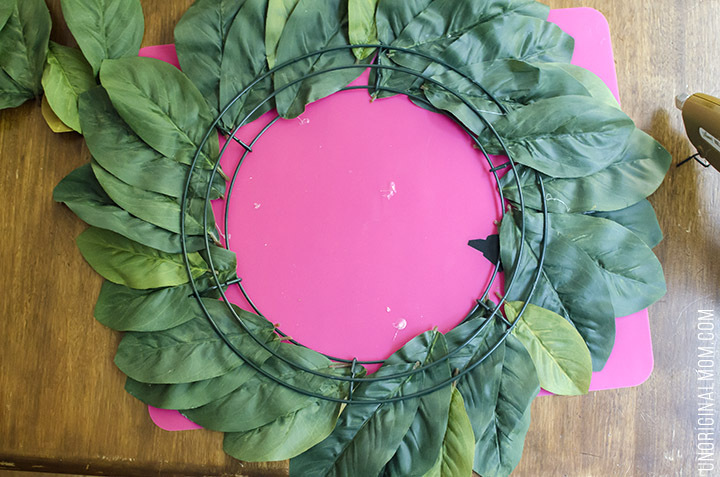 I love your version of the Magnolia wreath! My husband and I just purchased a manufactured home from the 90’s and are in the process of renovating parts of it that were abused. I don’t have the money for the luxuries of decorating so I am remaking what I have–repainting and so forth. 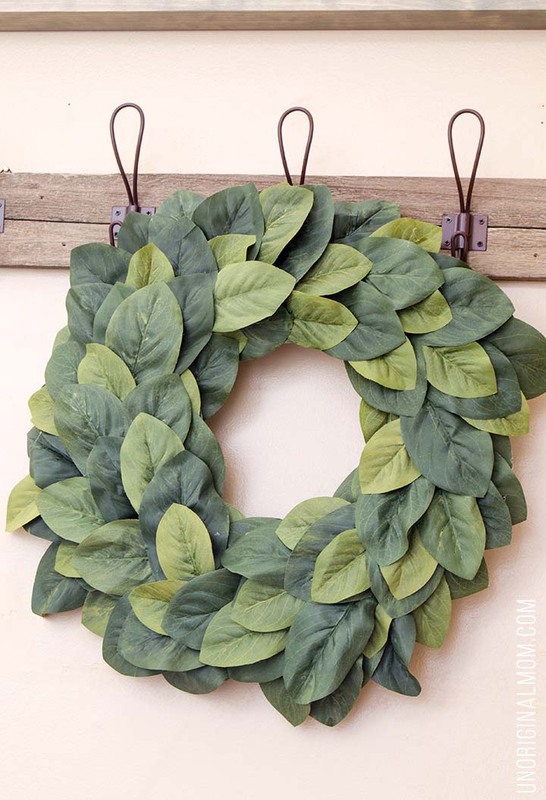 I do have the materials for this wreath and I thank you for sharing this on your blog. You have a new follower! I love your wreath, so am gonna try it, but where did you get your coat holder at? I have been looking everywhere for one like that. Thanks Sandi! 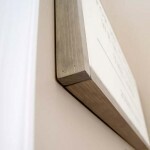 I found my hooks on Wayfair, here’s my affiliate link to the ones I got – http://bit.ly/2bAmbKY. I just made this tonight, yours is much cuter. But I love mine sooooo much. I’d love to collaborate with you on Instagram or Facebook??? Your ideas are amazing, thank you for all your tips and helpful hints! This college girl is thankful ?? I am so excited that I found your blog on Pinterest! I love this tutorial and can’t wait to try it! I can definitely relate to everything you wrote about here. I’m scared to tackle projects for fear that they won’t be perfect. Well, no more! Thanks for the inspiration! Now I’m going to stalk your blog and IG account for more inspiration ? 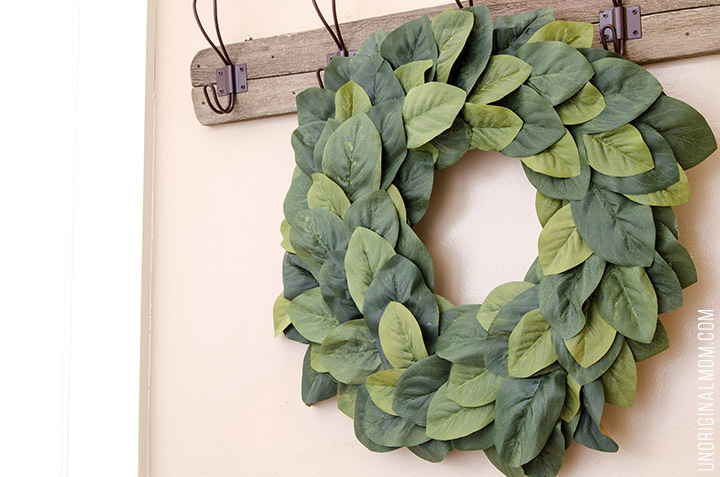 HI – I love your wreath, we too live in central PA and have a magnolia tree that is doing great. You should plant one, I am a huge Joanna fan as well. Can you tell me what colors of paint you used to get the effect? I love what you did and that is exactly what I want to do.